I’ve not written here lately because I’m been spending time with our audience, and helping them find ways to both improve and enjoy their own writing. 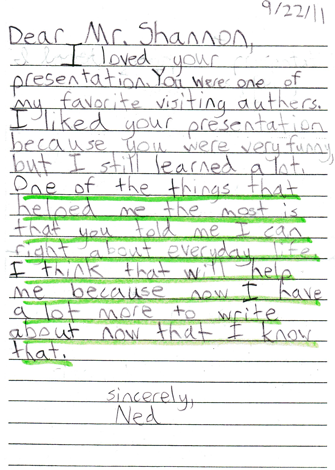 While I may use different references with children than I do with adults, writing is writing. 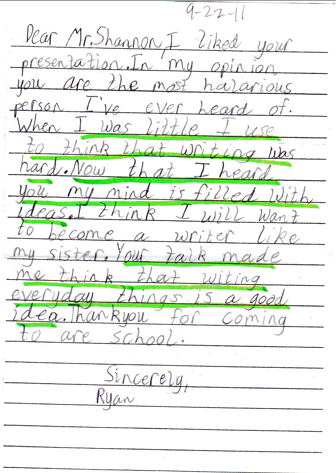 After a recent visit to Dallas letters from 4th graders let me know we had truly connected through the basics of writing. 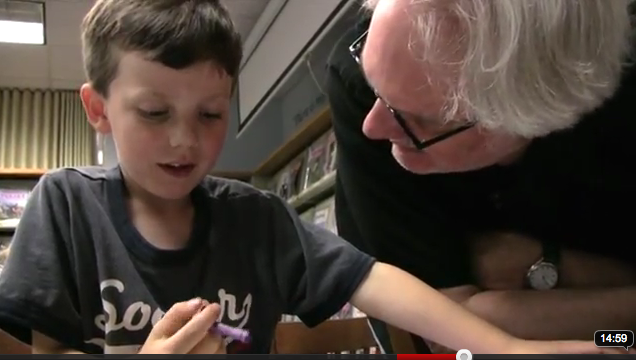 A video project in Washington state brought key aspects of writing to life in a different way. LISTEN, DRAW & TELL was sponsored by Thrive by Five Washington, The Culture of Literacy Council of Olympic & Kitsap Peninsulas, and Early Learning Coalition. Filming and production were provided by Stolee Communications & The Picture Project. Now, back to the puzzle and pleasure of writing for children. If you want to know what makes for a popular and lasting story read and reread the best-known folktales of your culture. Why? They’ve lasted through cycles of literary concerns and fads. And, at the same time, they remain alive and fresh to each generation. 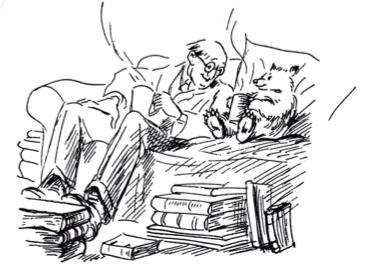 These stories continue to keep children’s imaginations bubbling and their respective bums in a chair. Clearly, they have a lot to teach us. There are all but countless picture book editions of folktales, but don’t rush to those first. One of the things folktales can teach us is how to write half of a whole. The verbal style of folktales leaves plenty of space and possibilities for the listener to create her own illustrations. That’s exactly what we must do as picture book authors who do not illustrate. Explore the folktale’s economy of language, crisp sentences, and active verbs. Collections of folktales come in all shapes, sizes, and voices. The editions most valuable to us are those written by people who have actually told them aloud. These storytellers/writers know the differences between oral language and written language. Even though they’ve told the tales aloud, they also had to make certain “translations” when they prepared them for the page. So, where to start? The answer is simple: Margaret Read MacDonald. She has spent decades telling stories, working as a children’s librarian composing books and collections, and has a PhD in folklore. If anyone lives a blend of scholarship and storytelling in the trenches, it is Margaret Read MacDonald. 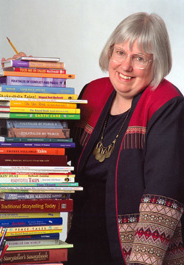 If you’ve not explored her collections or her picture books, you’ve missed an opportunity to learn and enrich your craft. MORE READY-TO-TELL TALES FROM AROUND THE WORLD edited by David Holt & Bill Mooney. August House, 2000. THE PARENT’S GUIDE TO STORYTELLING: HOW TO MAKE UP NEW STORIES AND RETELL OLD FAVORITES by Margaret Read Macdonald. August House, 2001 (1995). 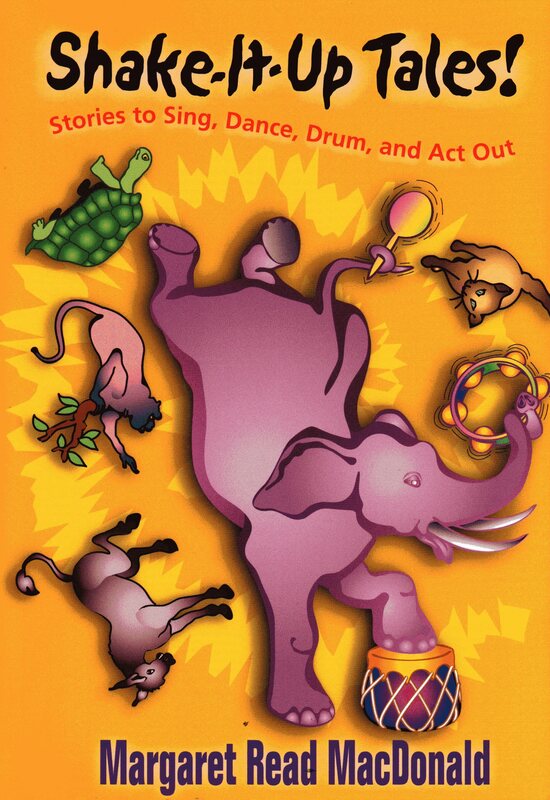 SHAKE-IT-UP TALES: STORIES TO SING, DANCE, DRUM, AND ACT OUT told by Margaret Read MacDonald. August House, 2000. THREE MINUTE TALES: STORIES FROM AROUND THE WORLD told by Margaret Read MacDonald. August House, 2004. Our role as adults working with children is a weave of caretaker, roll model, teacher, and docent. As writers, we are wise to also be entertainers. If we want to be effective teachers and docents, we must keep our young audience engaged. We must keep their minds entertained by new information. The word didactic is often used as a derogatory term as if it is synonymous with boring, bad, turgid or trite. However, didactic writing is simply a form of writing like mimetic is another form. The goal of mimetic stories, plays and books is to reflect the human condition. 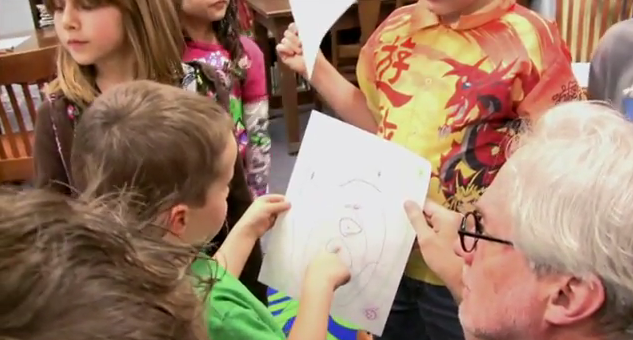 The goal of didactic stories, plays and books is persuasion, to change thinking and behavior. We all know from both ends of the experience that a wagging finger is the quickest path to losing an audience of any age. In order to persuade we must be engaging and interesting. 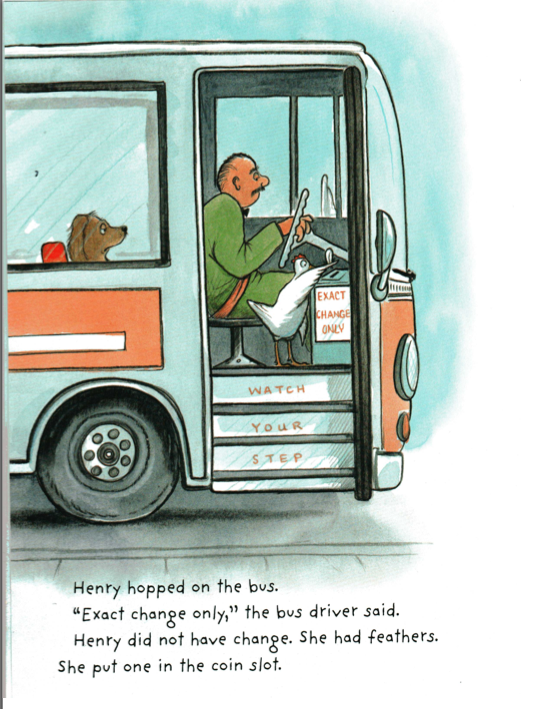 A book for any age about manners is clearly didactic. But in no way does this condemn such books to being boring, bad, turgid or trite. Exploring a range of picture books on manners reveals various ways we can keep the reader engaged while we hope to change behavior. As every court jester who kept his head knew, humor and the fable’s sense of distance were vital. 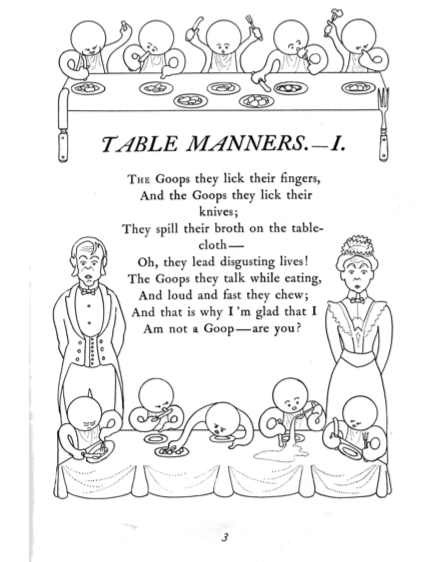 As a child of the 1950s, I loved and laughed at Gelett Burgess’ ill-mannered Goops. 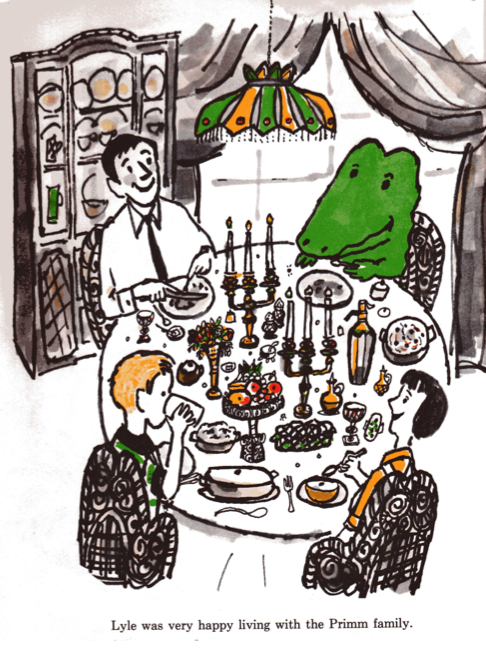 At school we had fun drawing replicas of Munro Leaf’s playful cartoons from MANNERS CAN BE FUN. Like the talking animals in fables, anthropomorphism allows the child a chance to view and laugh at his own behavior, yet still not feel like he is laughing at himself. 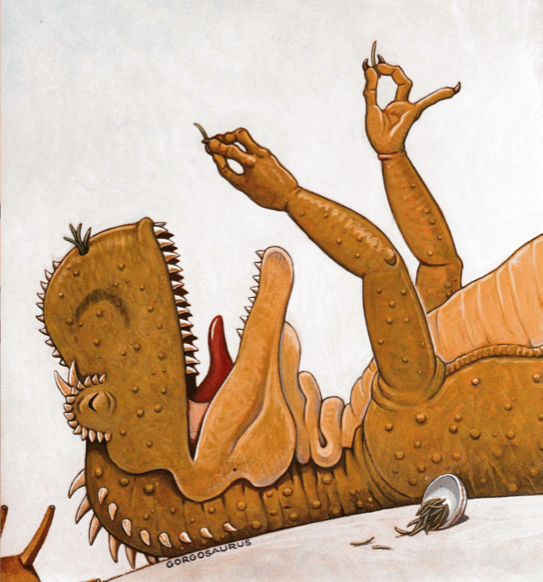 Long before Jane Yolen combined dinosaurs, humor, and Emily Post in HOW DO DINOSAURS EAT THEIR FOOD? 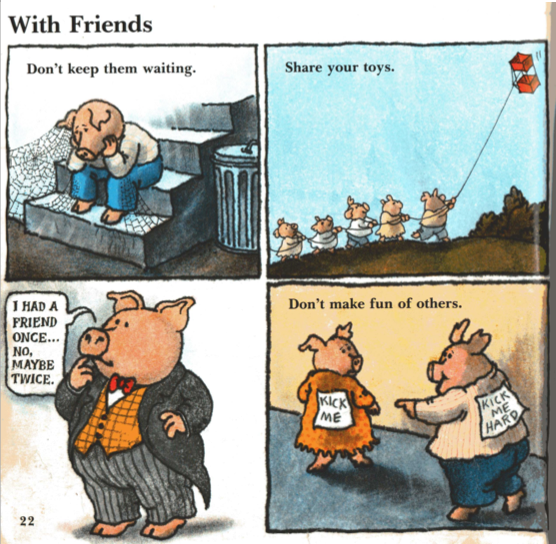 (and others in that series), Marc Brown and Stephen Krensky engaged a cast of pigs in cartoon panels to teach good manners. 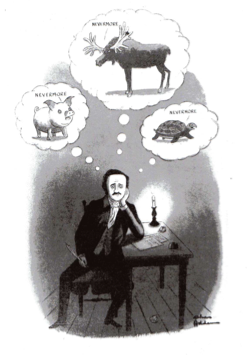 In addition to talking animals and humor, Brown and Krensky’s PERFECT PIGS: AN INTRODUCTION TO MANNERS includes a comical commentator whose naïve voice plays against the serious content of the text. Aliki employs similar light-hearted commentators in her MANNERS. This, along with her chosen style of panels and simple line drawings, keeps the book afloat even though she depicts children instead of talking animals. 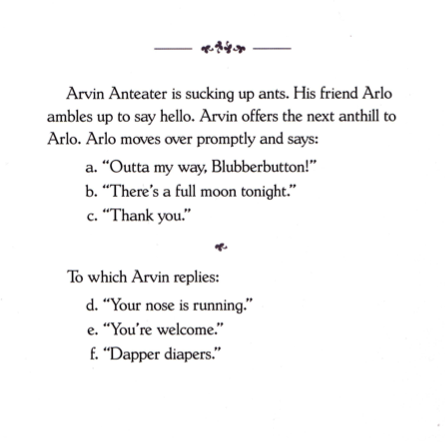 Imagine Aliki’s text illustrated with photographs of real children and the book would immediately gain 50 pounds of earnest weight. IT’S A SPOON, NOT A SHOVEL by Caralyn Buehner adds an interactive element to her text on manners. Children select which of three possible answers is the correct one. Though it might sound like a quiz her use of hyperbolic humor and Mark Buehner’s equally humorous talking animals make the book a playful game show. Humor isn’t the only way to make a book engaging as it attempts to persuade and change a child’s thinking or behavior. But it is certainly one of the best and most enjoyable. GOOPS AND HOW TO BE THEM: A MANUAL OF MANNERS FOR POLITE INFANTS, WITH 90 DRAWINGS by Gelett Burgess. Dover, 1968 (1900). HOW DO DINOSAURS EAT THEIR FOOD? byJane Yolen. Illus. by Mark Teague. Blue Sky Press, 2005. IT’S A SPOON, NOT A SHOVEL by Caralyn Buehner. Illus. by Mark Buehner. Dial, 1995. 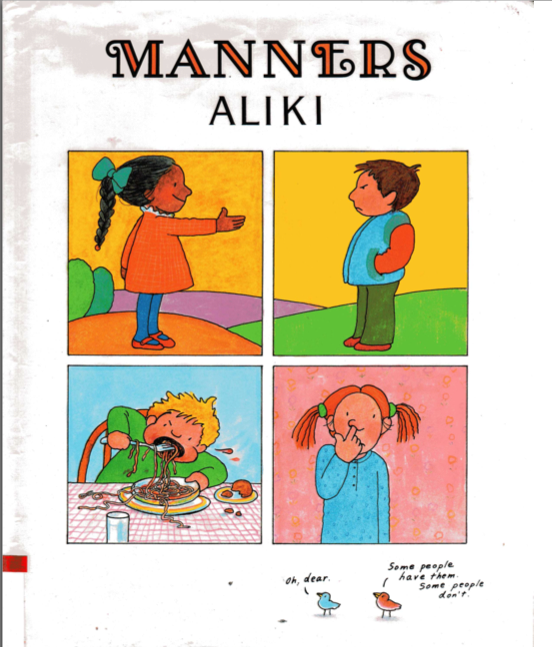 MANNERS by Aliki. Greenwillow, 1990. MANNERS CAN BE FUN by Munro Leaf. Universe, 2004 (1936). PERFECT PIGS: AN INTRODUCTION TO MANNERS by Marc Brown and Stephen Krensky. Little, Brown & Co., 1983. Teaching manners and being taught manners are both tedious experiences. So, what to do? Take a cue from the fabulists stretching from Aesop to Melanie Watt. Humor and a bit of distance can work wonders. People of any age can learn from Aesop’s fable “The Dog and the Bone” because it allows them to chuckle at a foolish dog. Yet that dog’s behavior also registers as human behavior and, thanks to the relaxing nature of humor, may spark a new understanding within the reader. 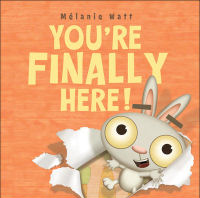 Such is the case with Melanie Watt’s latest picture book, You’re Finally Here! Like Ferris Bueller in his namesake movie, Watt’s Rabbit protagonist speaks directly to the audience. And, as audience, we quickly realize we are each the second character in this story. Rabbit, like most young children and an increasing percentage of adults, is all ego. He’s been waiting, and demands an explanation for the reader’s tardiness. Doesn’t the reader know how he feels to be left waiting? Doesn’t the reader know how rude that is? Rabbit makes attempts at being less demanding. Then…welcome to 2011…he gets a cell phone call while he is chastising the reader. He takes the call. Of course! Then he puts that caller on hold while he takes a second call and totally ignores the reader/me/you who is actually in the book with him. As this fun and pithy book ends, Rabbit is shocked that the reader is leaving even though he has ignored the reader/me/you for the last third of the book. While the majority of children ages 4 to 8 do not yet have their own cell phones, they have certainly experienced the frustrations of waiting and feeling ignored. You’re Finally Here humorously introduces them to their own rude behavior of expecting everything to center on them. For the savvy, self-satisfied modern adult, Watt’s book may bring a humbling glance in the mirror. 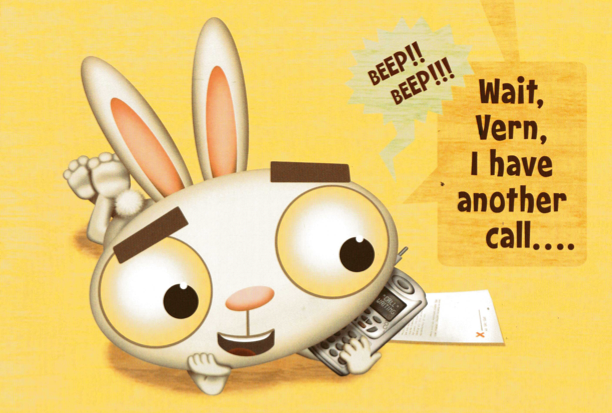 The cell phone has created a culture of egocentric rabbits. I’m needed. I’m important. I must be reachable. And, you can wait while I prove my importance again by taking this call. YOU’RE FINALLY HERE! by Melanie Watt. Hyperion, 2011. P.S. This book is also a fable for writers. If you want your reader to pay attention to you, you had better make sure you keep them engaged and attend to them. EVERYTHING OLD CAN BE NEW AGAIN! Two of the first things children in North America learn are animals and the sounds they make. Having mastered which animal emits which sound; mixing them up provides preschoolers a chance to celebrate their mastery by laughing at the mix up. 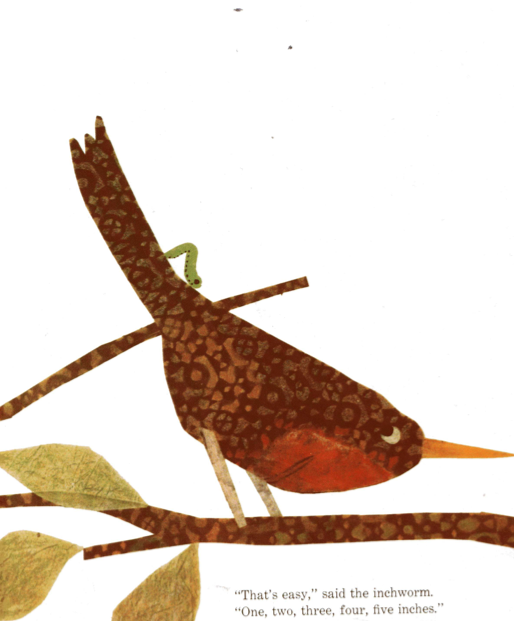 If you’ve seen one picture book about animal sounds and/or mixed up animal sounds, you’ve probably seen a dozen. So, why even touch the subject? You just might bring a fresh and refreshing twist like Emma Dodd with MEOW SAID THE COW. Initially British and just published in the U.S. this book with wry, sly, and boisterous illustrations puts multiple new spins on farm animals and the sounds they make. Cat resents Rooster’s early morning crowing. What to do? Dodd’s storytelling takes such bold steps the reader has no choice but to believe and follow along. Cat, known for his magic powers, casts a spell. 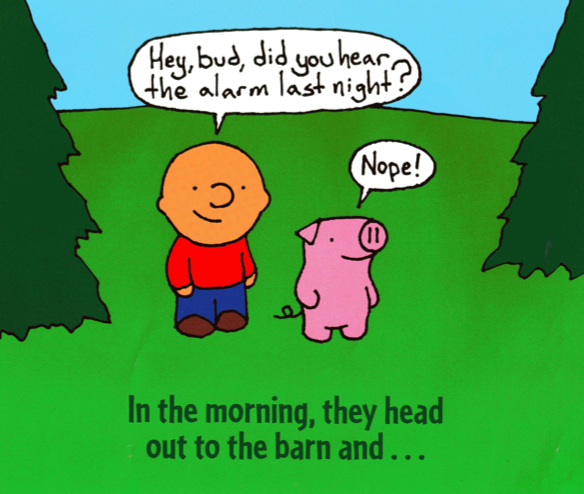 The next morning Rooster, cries a quiet, “squeak, squeak, squeak.” Pig goes cluck. Chickens go oink etc. When the animals figure out the confusion is due to Cat’s magic they band together and demand Cat undue his spell. P.S. Take note that there is a steady amount of rhyming, but it so rarely calls attention to itself the rhymes are felt rather than noticed. 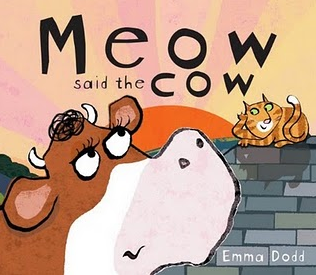 MEOW SAID THE COW by Emma Dodd. Arthur A Levine Books, 2011 (2009). As picture book writers, we have a braid of dreams. First, to write a book that expresses something we want to share. Second, a book that connects with our audience, engages the child. Third, a book that will last. If there was a workshop for achieving these goals, we’d all be signed up and sitting in the front row. Alas, no such workshop exists. What we can do is study picture books that have lasted andremain fresh. Several such books are by Leo Lionni. His seemingly simple texts that speak to the human condition continue to captivate children. Lionni’s best-known picture books are now over 40 years old, and still in print. Students in all the arts begin by studying the masters. So should we. FREDERICK by Leo Lionni. (Pantheon, 1967). INCH BY INCH by Leo Lionni. (Harper, 1960). 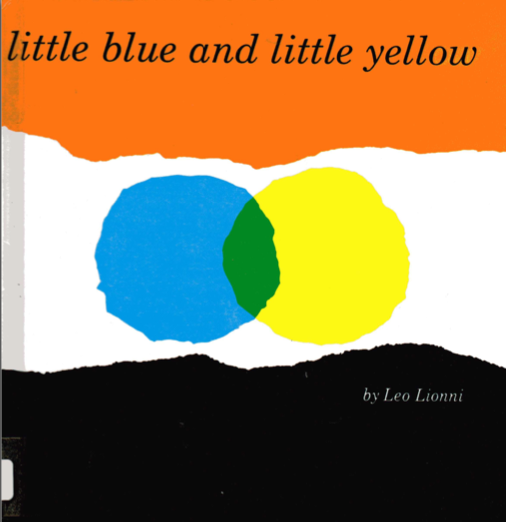 LITTLE BLUE AND LITTLE YELLOW by Leo Lionni. (Harper, 1959). “My Books for Children” by Leo Lionni in AUTHORS AND ILLUSTRATORS OF CHILDRLEN’S BOOKS: WRITINGS ON THEIR LIVES AND WORKS edited by Miriam Hoffman and Eva Samuels. (Bowker, 1972). SWIMMY by Leo Lionni. (Pantheon, 1963). Often Good for a Laugh! As picture book writers who do not illustrate, it doesn’t take much some days to leave us feeling powerless. Us? Think about our young audience that is literally at the mercy of the adult world. Any time a young child experiences a moment of mastery it is a time of delight. One source of this delight is found in picture books that feature nitwits or naïve characters in peril. 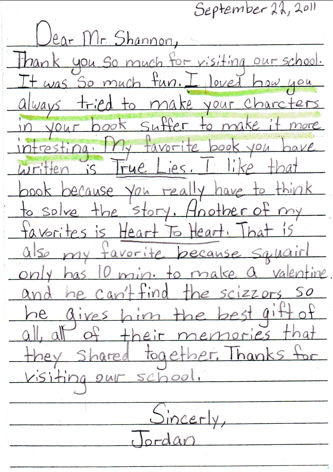 The young reader celebrates because she truly knows more than the character. She gets the joke and experiences compassion for the less aware character. If you’re interested in writing stories that share humor and delight and give children a chance to celebrate their growing wisdom, explore these wonderful examples of classic nitwits and blissfully unaware characters. ARE YOU A HORSE? by Andy Rash. Arthur Levine Books, 2009. 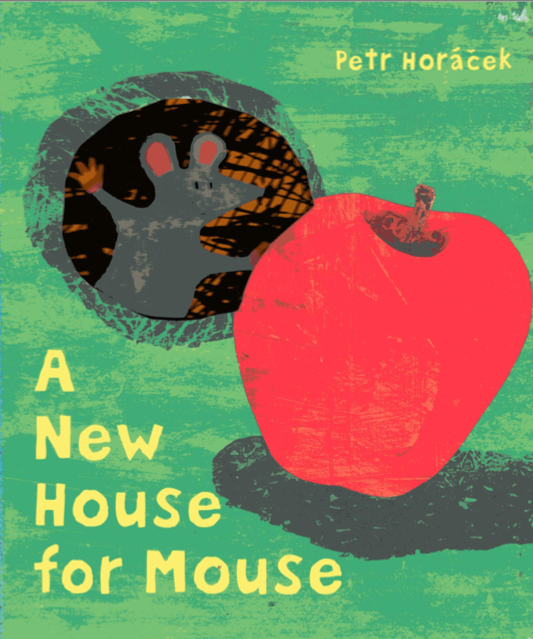 A NEW HOUSE FOR MOUSE by Petr Horacek. Candlewick, 2004. 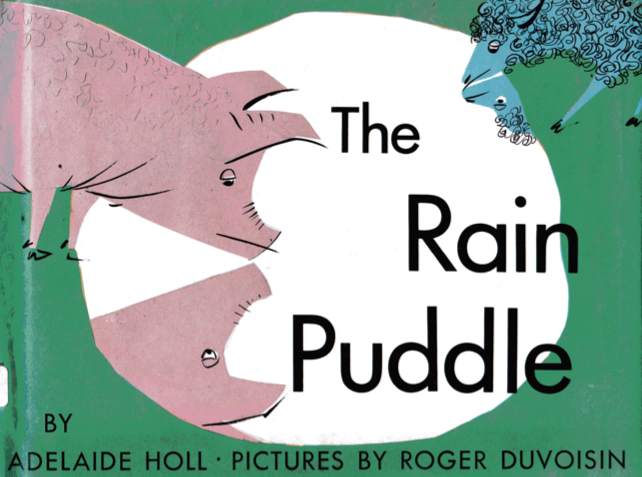 THE RAIN PUDDLE by Adelaide Holl. Illus. by Roger Duvoisin. Lothrop, Lee & Shepard, 1965. This basic plot has much in common with Alfred Hitchcock’s films. Think of REAR WINDOW when we know that Jimmy Stewart is in far more danger than he knows. The murderer is coming! However, in picture books humor prevails because it is quickly established that the villain is even more naïve than the intended victim. Hitchcock meets Wily Coyote. 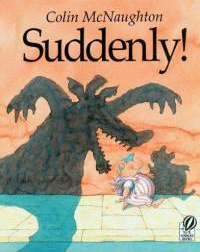 LOOK OUT, SUZY GOOSE by Petr Horacek. Candlewick, 2008. SUDDENLY! by Colin McNaughton. Harcourt, 1995. Try taking one of these plots as the thread to a story and see what new beads you can string. For example, ARE YOU A HORSE is a parallel to ARE YOU MY MOTHER? (Eastman). In THE RAIN PUDDLE when naïve animals see their reflection in a puddle they assume they are looking at a real hen etc that has fallen into the puddle. KITTEN’S FIRST FULL MOON (Henkes) features a kitten that “sees” a bowl of milk in the pond. And, many folktales feature characters that assume a mirror is actually a painting of someone else. Your next manuscript could already be sneaking up behind you! Directors of all media know that who they cast in a role is as vital as the actor’s talent. Imagine Sophia Loren as Maria in THE SOUND OF MUSIC or Julie Andrews in PULP FICTION. Selecting the cast or species can be equally significant in a picture book. Arnold Lobel often spoke about how the natural expressions of frogs and toads helped create their contrasting personalities. The casting of a frog and toad was also a wonderful match for the setting and tone of Lobel’s stories. FROG AND TOAD stories are garden or pastoral stories. Though Frog and Toad may be wearing pants they still exist in their natural environment. Recasting the stories with Dingo and Jackal would be disastrous. When James Marshall cast hippos as George and Martha he was also matching cast with tone, albeit in a different way. A significant part of the humor comes from massive hippos engaged in daily, dainty activities. Imagine George and Martha as mice, and the comic energy drops. Mice, however, were an inspired choice for Leo Lionni’s FREDERICK. Mice are natural gatherers and nesters. They are small and share intimate environments. Whether one wants them in the house or not, they still have a coziness about them. Recast Frederick as a rat, and the story changes. Recast Frederick as a hippo, and the story is all but lost. Why? Hippos are not gatherers. Nor do they have to worry about surviving winter’s cold. 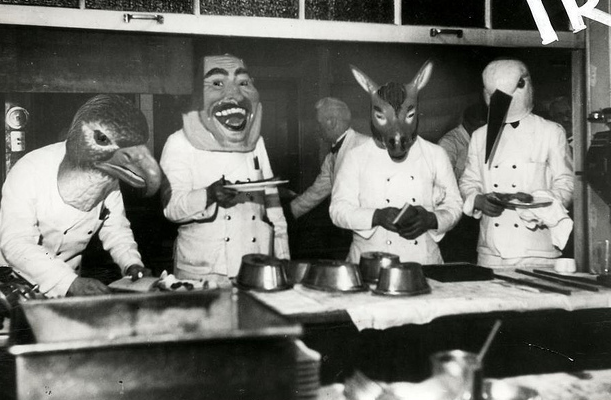 When we work on an anthropomorphic story we wise to serve as casting agent. Rather than grab the first species that comes to mind or the one we think is the cutest, audition several species. What does each one add or detract from the theme and story you want to share. As the Charles Addams cartoon above demonstrates, casting can make all the difference. Explore the picture books listed below, and ask yourself how the cast or species serves the story and how. Is the species inconsequential? Or perhaps undermine the story. DANDELION by Don Freeman. Viking, 1964. HILDA MUST BE DANCING by Karma Wilson. Illus. by Suzanne Watts. McElderry, 2004. THE MOLE SISTERS AND THE RAINY DAY by Roslyn Schwartz. Annick, 1999. POUCH by David Ezra Stein. Putnam, 2009. SHELLEY, THE HYPERACTIVE TURTLE by Deborah M. Moss. Illus. by Carol Schwartz. Woodbine, 1989. ZELDA AND IVY by Laura McGee Kvasnosky. Candlewick, 1998. As I tell elementary students, if you want to be a great soccer player you study the best soccer players in addition to practicing a lot. The same is true if our goal is to write the best picture books. Soccer has Pele, Beckham and Ronaldo. 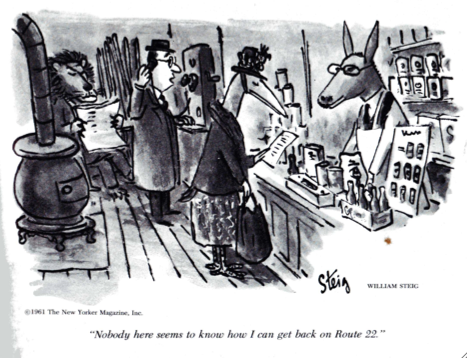 Picture book writers have many models, including William Steig. Before he began to write and illustrate children’s books William Steig had a long career as a cartoonist with THE NEW YORKER, and several thematic anthologies published. The 1961 cartoon (above) was an unknown preview of his forthcoming books for children. 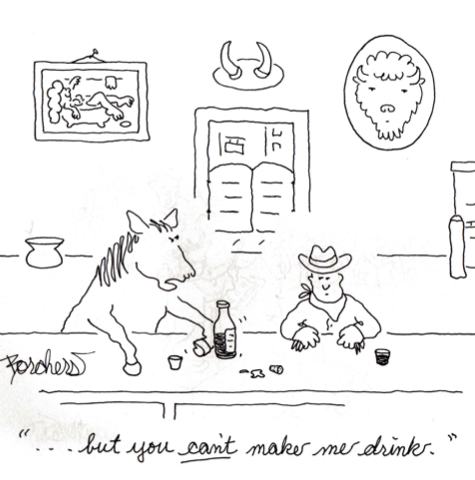 This NEW YORKER cartoon is especially interesting because it juxtaposes the human world with that of talking animals. Steig is best known for his books featuring talking animals. But he also created some engaging books featuring humans. 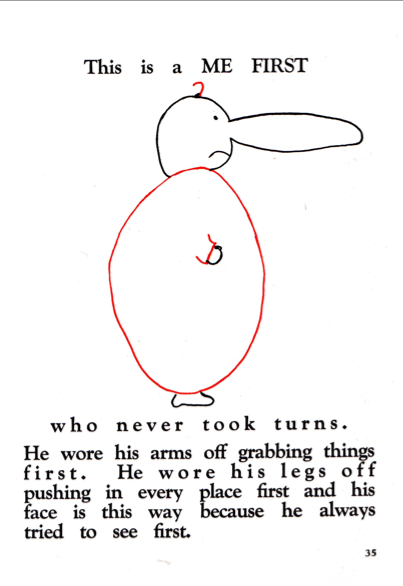 Steig is perhaps most famous for SYLVESTER AND THE MAGIC PEBBLE which won the Caldecott Medal. Like SYLVESTER, THE AMAZING BONE (1976) shares a story that would be impossible to tell with human characters. Pearl, a well-dressed and dreamy pig, is the protagonist. She lives in a parallel world where all animals are upright, dressed and articulate. Once that level of suspended disbelief is established, it is a small step to accept that Pearl has discovered a bone that talks. Editors would run screaming from a manuscript that had a human child kidnapped and threatened with cannibalism. But once you have talking pigs in frocks, all is possible and safe. DOCTOR DE SOTO (1982) features talking animals in a parallel world, but a world where the basic instincts of animals remain in place. 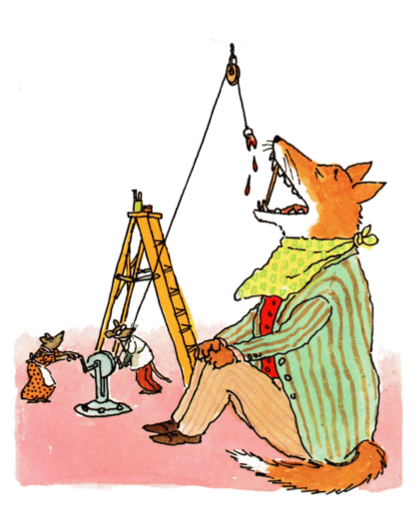 Dr. De Soto (mouse) and his client (fox) both wear tweed suits. They also know fox’s ultimate and natural objective is to devour the mouse. Some would call that destiny. Steig and Dr. De Soto call it bunk! Dr. De Soto prevails in a classic example of brains over brawn and nurture over nature. Once again, a story with this level of danger and darkness could not successfully be told with human characters. When neither magic nor cruelty was involved, Steig was able to appropriately feature human characters in a way that made those stories more engaging. Irene in BRAVE IRENE certainly experiences some lucky turns of fate in her story. But, because the thrust of the story is a girl’s determination and accomplishment it is best cast with humans. Portraying Irene as a pig in a frock would have weakened the tension and emotional path of the story. When asked what he thought of talking animals, author/editor James Cross Giblin said, “It depends on what they have to say.” As William Steig demonstrates, it also depends on the specific story we want to share. 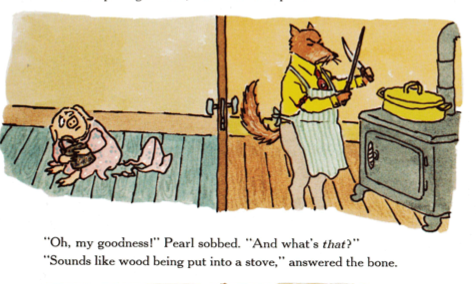 THE AMAZING BONE by William Steig. Farrar, 1976. 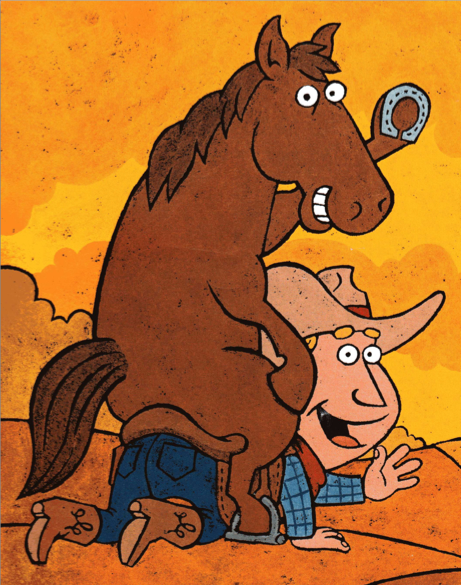 ANIMALS: A COLLECTION OF GREAT ANIMAL CARTOONS edited by George Booth et al. Harper, 1979. 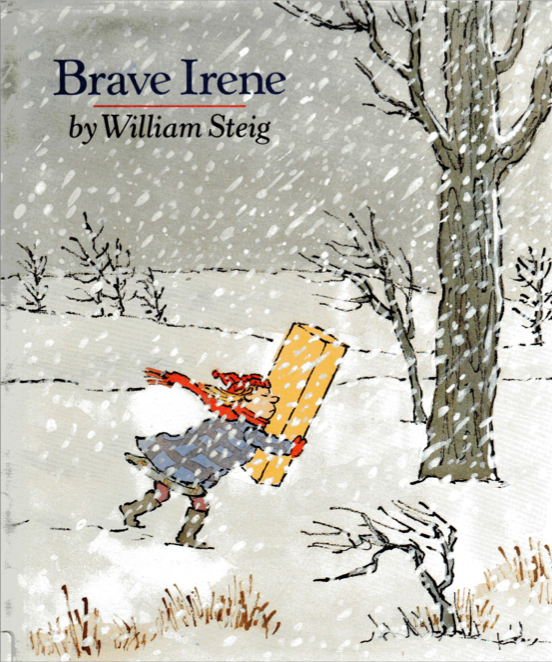 BRAVE IRENE by William Steig. Farrar, 1986. DOCTOR DE SOTO by William Steig. Farrar, 1982. Four of the most powerful words in literature are “once upon a time.” When a story begins with those words anything can happen and all is believed. Little Red Riding Hood doesn’t bat an eye when a wolf begins to talk. Or, vice versa. Fat Cat can converse with soldiers as easily as washing ladies, mice, and kings. Not to mention, swallow them whole then set them free without any harm. Without that classic phrase to suspend disbelief contemporary writers tend to accomplish the same in two ways. Both come down to the strength of the author’s conviction and voice. Those writing novels for older children often establish this leap of faith in a simple, broad stroke. In THE MOUSE AND THE MOTOCYCLE Beverly Clearly calmly states “Neither the mouse nor the boy was the least bit surprised that each could understand the other. Two creatures who shared a love for motorcycles naturally spoke the same language.” Michael Bond’s explanation for Paddington Bear speaking English is equally succinct. Paddington’s Aunt Lucy back in Peru talk him English so he would be able to immigrate to England and fend for himself. Case closed. Given the brevity of picture books, authors in this genre are even more economic. Carpe diem. No need to explain. Simply jump in and believe. 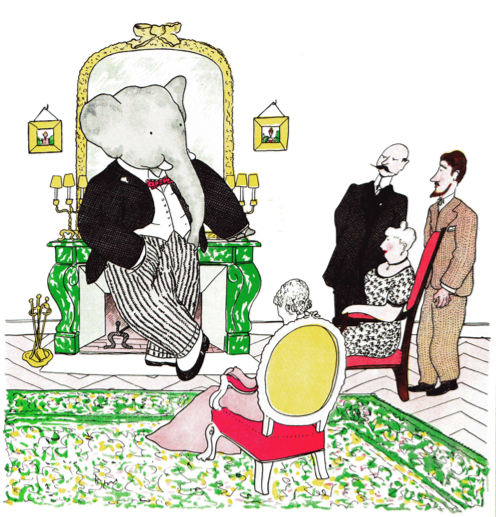 Jan De Brunhoff’s text and illustrations for THE STORY OF BABAR calmly have elephant, wealthy lady, and other city folk conversing as fact. There is no time for doubt because the story keeps moving forward in a confident voice. The famous crocodile and New Yorker, Lyle, also lives naturally among humans. Like Babar, Lyle never speaks specific dialogue in quotation marks, but he converses without everyone. Nor is anyone surprised or concerned to see him in department stores or antique shops. Maxwell Eaton’s series featuring Max and Pinky (including THE MYSTERY) leaps forward in its own way. Max is human. Pinky is a pig who often wears painter’s overhauls like Max. They communicate with each other as well as the more natural, non-dressed animals on the farm (horse, turtle, bird and mouse). Once again, people and animals talk to one another. Case closed. On with the story. It is important to realize how illustrations can greatly contribute to this leap of faith. Varying degrees of cartoon-style illustrations work best in supporting the leap into animals casually conversing with people. The greater the visual realism the harder it is to step beyond that realism. While we may not be able to control the illustrations, we writers who do not illustrate can still provide solid guidance through our voice and the directness of our descriptions. Be sure. Be firm. Be nonchalant. Animals and humans may have conversed once upon a time, but there is no reason they can’t today. We just have to believe it ourselves. A BEAR CALLED PADDINGTON by Michael Bond. Houghton, 1958. CITY CHICKEN by Arthur Dorros. Illus. by Henry Cole. Harper, 2003. CORNERED ANIMALS by Randall Borchers. Adama Books, 1988. 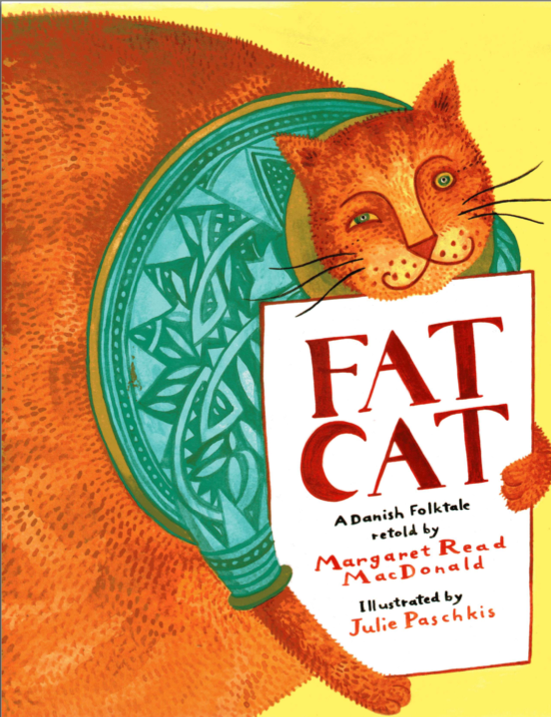 FAT CAT: A DANISH FOLKTALE retold by Margaret Read MacDonald. Illus. by Julie Paschkis. August House, 2001. LYLE, LYLE, CROCODILE by Bernard Weber. Houghton, 1965. 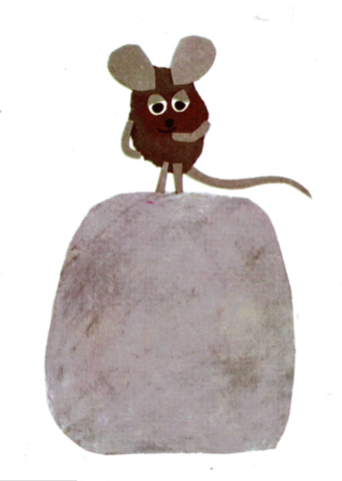 MARTHA THE MOVIE MOUSE by Arnold Lobel. Harper, 1966. THE MOUSE AND THE MOTORCYCLE by Beverly Clary. Harper, 1965. THE MYSTERY by Maxwell Eaton III. Knopf, 2008. NORMAN THE DOORMAN by Don Freeman. Viking, 1959. THE STORY OF BABAR by Jan De Brunhoff. Random, 1933.